It was at the Southwell Ploughing Match and Show in Nottinghamshire last autumn that Roger Punch, Consultant at Marchand Petit, first met Blue Force Chairman Philip Gibson and Treasurer Peter Plehov. These two intrepid men had had an unusual idea. They had been planning a road trip with a difference to take place in 2017, which would take them around the coastline of England, Wales, Scotland and even part of Ireland. The aim of this grand scale tour was two fold; first it was the once-in-a-lifetime chance to celebrate 100 years of tractor production started by Henry Ford and encompassing Fordson, Ford and New Holland machines built in Cork, Dagenham and now Basildon and secondly to raise money for registered charity STEPS, a children care centre and Cancer Research UK. 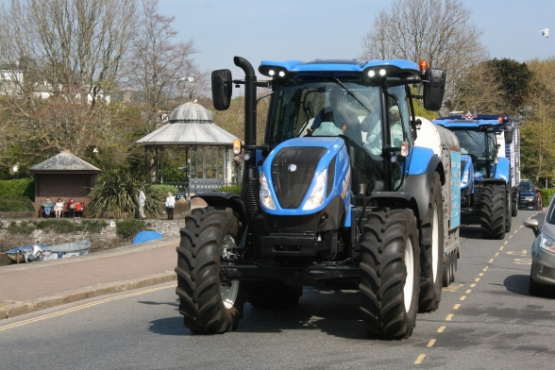 So, Phil and Peter set off from the New Holland Basildon factory in Essex, on 13th April, on two brand new T6 tractors kindly loaned by the manufacturer. One towing a home-built Shepherd’s Hut to serve as their accommodation and the other trailer carrying fuel, oil and general supplies. “Talking a clockwise tour around the country, travelling at 32mph where roads allow, meant that the duo would arrive in the South Hams over Easter and as Marchand Petit are dedicated to supporting the community, this was one inventive fund raiser we wanted to sponsor. Especially as their route would take them through all the towns and villages where we have sales and residential letting offices,” concluded Roger Punch. Many turned out to greet and meet the intrepid drivers, admire the tractors and some even climbed aboard and rode shot gun, as the impressive spectacle successfully completed another leg of their Coastline Tractor Challenge.